Sweet and Salty Scones | "What's Cookin', Mamele?" I promised more sweet and salty/savory recipes, and here I am to deliver. 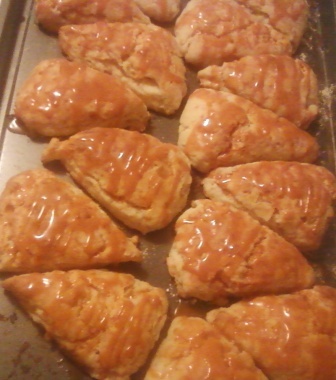 This one is for caramel apple cheddar scones. My two-year-old absolutely loved them and my husband didn’t mind having one for breakfast this morning either! They are sweet and salty and buttery and just plain delicious. They’re also pretty easy which is good for me when it comes to baking. Preheat your oven to 400 degrees. In a small sauce pan, soften the diced apple in 1tbsp butter with the cinnamon. Set aside. In a large bowl, whisk together the flour, baking powder, sugar, and salt. Then, add in your shredded cheese and toss to evenly distribute through flour mixture. Coating the shreds now keeps them from lumping up and getting gummy when you’re adding the butter. Next, rub in your stick of butter or use a pastry cutter until the mixture looks slightly ‘sandy’ and the butter is evenly distributed. Fold in the cooled apples gently and then begin adding the cream. I would add 1 cup and then add a tablespoon or so more as needed. It shouldn’t take more than 1 1/2 cups; though, this really depends on how dry your flour is, the humidity in your house, etc., but the end goal is to get a slightly sticky dough. Turn your sticky dough out onto a lightly floured surface, divide in two, and then shape each lump into a round about 6″ in diameter. Cut the rounds into 8 even wedges using a floured knife or mezzaluna. Use a spatula to move the wedges to an ungreased baking sheet alternating directions and spacing them 1/2″ apart (see picture below). Brush with 2tbsp milk. Bake for 20-25 minutes or until just golden brown. Once the scones are removed from the oven, allow them to cool slightly on the pan (10 minutes or so) and then use a spoon to drizzle over your ‘caramel.’ For an extra sweet/salty punch, you could sprinkle some coarse sea salt onto the drizzle. Yummy and they take less than an hour (or 45 minutes if you’re industrious) to make. Makes 16 delightful little scones.